As much as we would like to deny it, Christmas is only a matter of weeks away, stores are over flowing with Christmas gifts and it is probably only days before the first Christmas cards start to drop through the letter box. Besides the decorations, merry atmosphere and an excuse to snuggle up with a glass of mulled wine in front of the fire, certainly my favourite part of Christmas is the food! My Mother-in-Law has made these fantastic Christmas Pudding tree decorations which are the perfect size to fit in a Ferrero Rocher....the Ambassador would be impressed! They are absolutely adorable and I'm really looking forward to displaying mine on the Christmas Tree and of course eating the contents. 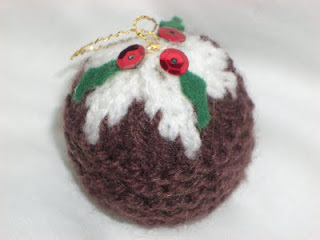 Hi Becca-Lou, Do you have the christmas pudding pattern or the link please, I have seen these puddings the other day on the internet but I cant find them now and have been looking for them.